When I read studies and statistics showing that there are more pollutants in the air inside our homes than outside, that just makes me cringe. With the amount of time that we spend indoors around here, the idea that my family and I are breathing in so much air that isn't clean is frightening. What is that doing to my kids' developing bodies, lungs, and immune systems? 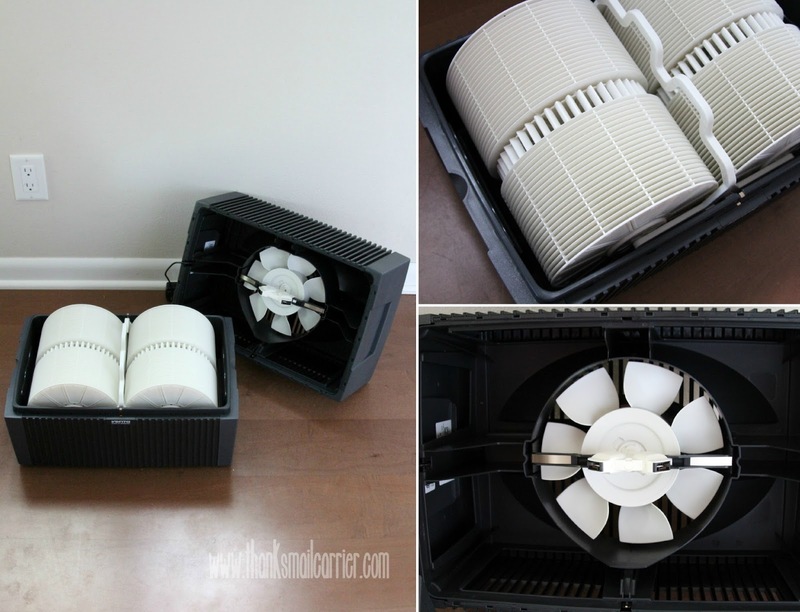 Therefore, instead of staying with the cycle of using little and inexpensive humidifiers that inevitably stop working and are then replaced with another small and cheap one, it is time to take the best possible care of our families by providing them with perfectly humidified and clean air all at once. 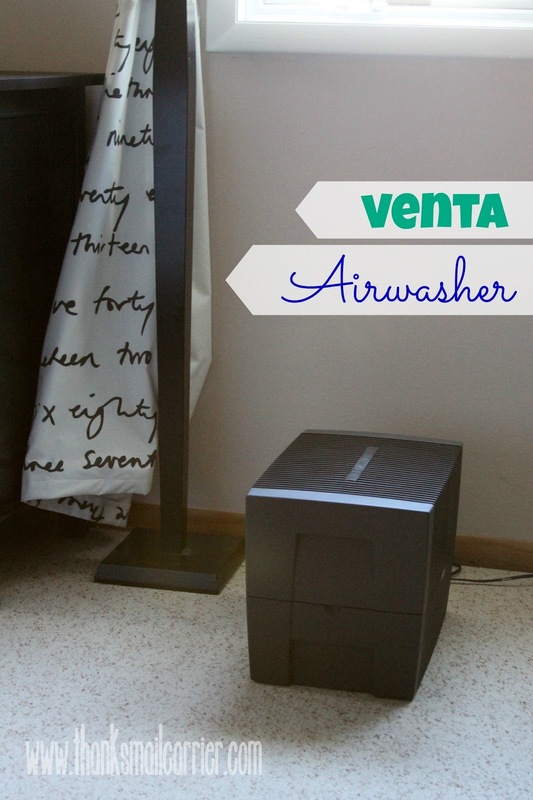 Because that's what is precisely possible with the Venta Airwasher! The original dual design humidifier and purifier, the Venta Airwasher was invented in Germany in 1981 and is still manufactured there today. As opposed to standard machines that require constant setting changes, use a great deal of energy, leave a white film, strain your budget by needing expensive filters, and more, a Venta Airwasher is just the opposite. Instead, this filterless humidifier and air purifier is designed to work in harmony with your heating and cooling units to properly rehydrate the air, eliminate dust, and remove allergens so you can relax, knowing that the whole family is breathing easier at home. 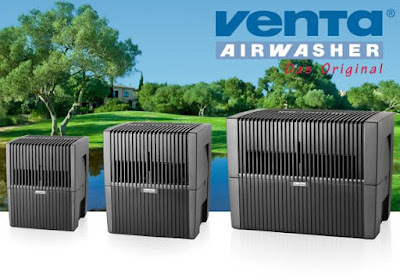 In fact, along with the low maintenance, ease of use, and zero filters to purchase, the Venta Airwasher utilizes a revolutionary cold evaporation method. What this means is that the air in your environment takes only the moisture it needs from the Venta Airwasher, and no more. 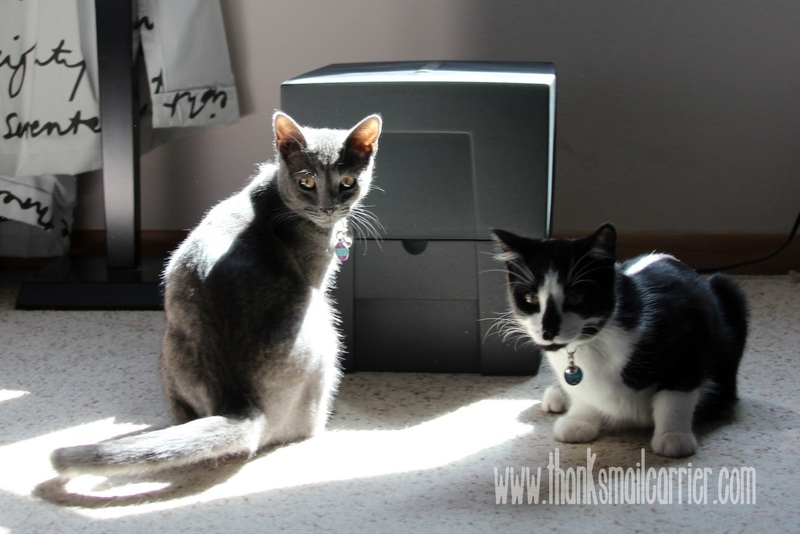 This unique feature makes this machine an ideal air purifier 24 hours a day, 365 days a year! After reading up on the Venta Airwasher and all of its benefits, I knew that I needed to see just how much it could help take care of my family with perfectly humidified and clean air in our home. Right away I appreciated that the Venta Airwasher LW45 came fully assembled and was nearly foolproof to begin using. Simply remove the upper housing (containing the motor and cord) and, with that portion safely away from your water source, go ahead and fill! Once your Airwasher is filled and ready to go, it just needs a home that is at least two feet from walls, with neither of the vented sides facing towards a wall. The only daily maintenance required is to make sure that the Airwasher is filled with water and Venta does recommend emptying it completely and cleaning it out twice a month (if you don't want to wipe it down, every part of your Airwasher, with the exception of the motor, is dishwasher safe). Otherwise, due to the simple control panels located right on the top of the LW45, basically all I have to do is press a button and know that perfectly humidified and freshly washed air is filling my home! 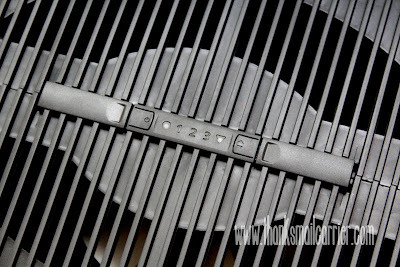 I love that the Venta Airwasher is designed to be turned on and left on at all times, as that is one less gadget or device in my house that I need to devote a lot of thought to. Instead, due to the way that the Airwasher can sense when the room air is hydrated just right, it will then simply just stop taking moisture and risk over-humidifying the room. No forcing more and more moisture into the air if it doesn't need it! Plus, the list of benefits of having an Airwasher goes on and on! It includes moisturized skin that feels healthier and younger; less colds, sniffles, allergies, headaches and sicknesses; fewer pet odors and static electricity; and more. I love knowing that my Venta Airwasher can wash the pollen, dust, mites, bacteria, germs and more right out of the room. The result is a healthier environment for all of us and less stinky odors along with it! Ready to find out how a hygienic, premium quality, low-maintenance (remember, NO filters! ), eco-friendly machine that is extremely simple to use, fill and clean can help in your home? Then head over to Venta-Airwasher.com to see more on how the Venta Airwasher works, to join the Venta family by making a purchase (also available on Amazon), to find out which size Airwasher is right for your space, and more. These amazing Airwashers are available in three sizes (in black or white), for small, medium and large spaces and retail for $219, $299 and $399, respectively. You'll also want to connect with Venta on Facebook, Twitter and YouTube to stay up to date on the latest and greatest from this innovative company and their one-of-a-kind products. 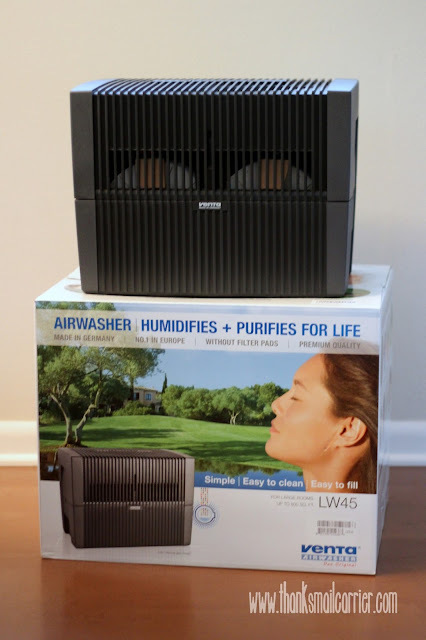 Other than the Airwasher LW45 I received from Venta in order to facilitate my review, I was not compensated or enticed to do this post in any way. This review is solely my honest opinion about this product. Thank you for your post!! This is Jenny, Marketing Associate with Venta Airwasher. On behalf of Team Venta, I want to say how grateful we are for this wonderful review from Thanks, Mail Carrier and all of the overwhelmingly positive reviews we have been receiving from American consumers. We love helping people and have been the problem solver for the past 30 years. We look forward to introducing everyone in the U.S. to the Airwasher and to perfect indoor air. Any Thanks, Mail Carrier readers who have questions, please feel free to call our toll-free customer service line at 888-333-8218 and chat with one of our friendly Venta Team members!